Remember the lovable Galway girl from Irish Eyes? Do you? Good. Well, she’s back in this much-anticipated sequel to the shamrock classic. This new instalment of slots features much sharper and vivid graphics and a whole load of new features. The mischievous leprechaun no longer wanders the forest but the red-haired Irish beauty is still present. Play this game at Wizard slot games. 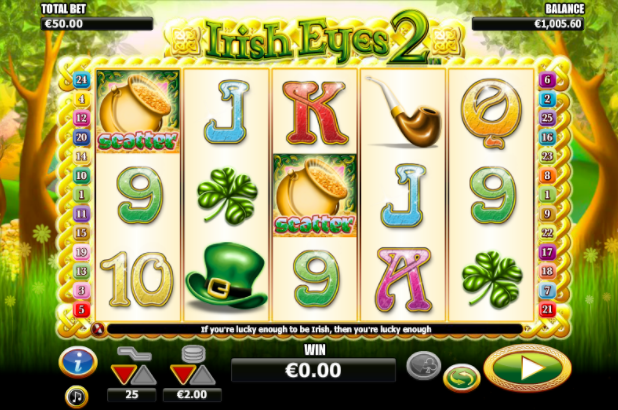 This slots game continues the Irish Eyes theme started by Nextgen and you can tell that these guys are slots players themselves as its clearly got features and styling that will appeal to other slots players. Great graphics, flexible betting options, and some excellent bonus features add up to a winner and a worthy successor to the original slot games. Escape to a beautiful Irish landscape where the land is green and fertile, the sun is always shining and Irish Eyes are smiling. Add in some lively Irish jigs and beautiful Irish girls and you have a vision of Irish utopia, somewhere you will want to stay and somewhere you will want to visit again and again. The plethora of bonus features mean you can win in all sorts of ways. The symbols are all lucky Irish themed, things like four-leaf shamrocks, leprechaun hats and lucky pipes are all symbols of luck, as are the golden heart shaped rings, and with all this luck on your side, your chances must be good. If you're in search to play best slots this site can bring, you're in the right game. Slots players of varying budgets will also have the luck of the Irish with them as well, with a massive range of betting options and line choices. Play between 1 and 25 lines and choose your stake, giving you a range of 175 staking permutations. Get that winning Irish luck straight away by winning prizes in any order, with the lowest prizes starting when you can find between 3 and 5 matching letter symbols, all of which pay into your pot of lucky gold. If you discover some of the lucky symbols you will be like the proverbial lucky leprechaun at the bottom of the rainbow. Look for four-leafed shamrocks, leprechaun hats and golden heart shaped rings, to really rack up that pot of gold. The Irish jigs will get you in the mood for a little Irish dance, which is what you will be doing when the beautiful Irish girls start to go wild! When those girls go wild they’ll appear on the reels and give you instant prizes. Keep an Irish eye out for the Pots Of Gold as these represent the games scatter symbols. On this online slots game, the scatter symbols have the capacity to pay you up to 100x your total stake and also have the ability to trigger some amazing free spins for you! 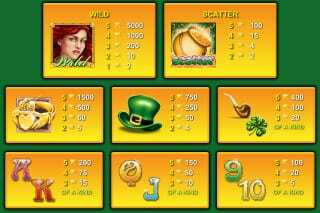 3 symbols will activate 10 free spins, 4 symbols will trigger 15 free spins and if the luck of the Irish is with you, and you land 5 symbols you will activate 20 free spins. However, the real Irish beauty of that is that during your free spins then all your prizes are trebled! Nextgen has another winner on their hands in our opinion. 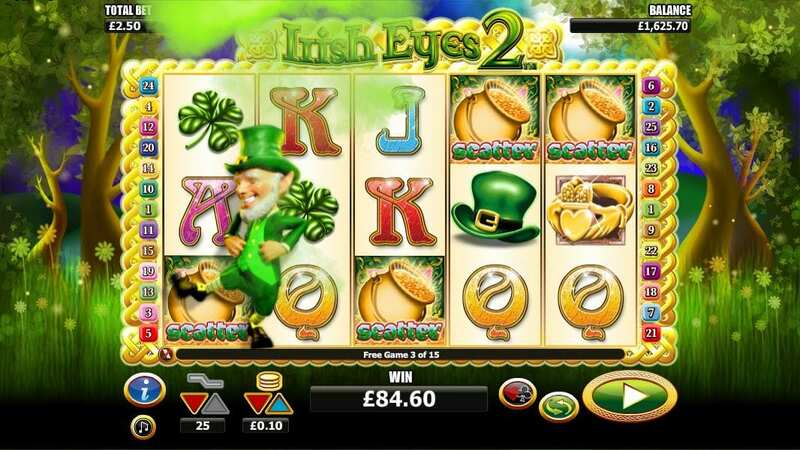 We love the theme of the Irish Eyes genre, with the music, graphics and Irish backdrop adding to the overall theme of Luck of the Irish. Importantly though, the gameplay is straightforward and easy to use, the bonus features are excellent and the payouts are very good. We think you will be over the lucky rainbow with this game, its fun to play, good to look at and cheery and bright! Top o the morning to ya! Another game similar to this is hansel and gretel slots.